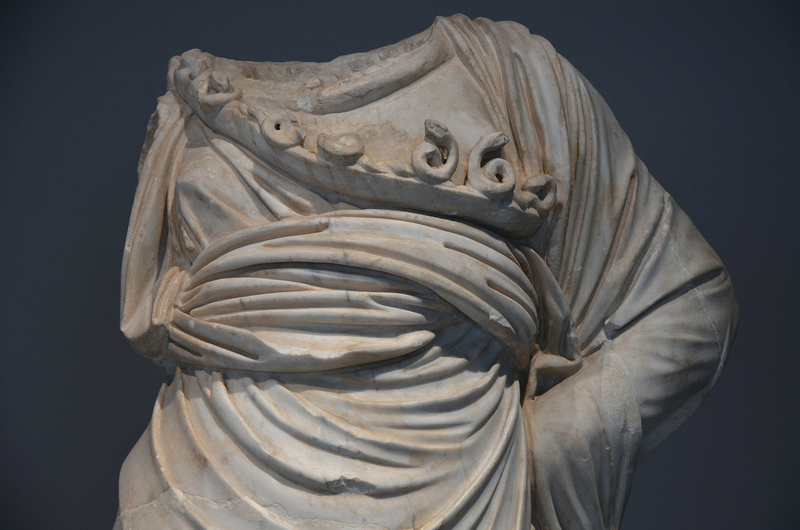 This month’s sculpture from Hadrian’s Villa is a headless statue of Athena of the Vescovali-Arezzo Type and made of Luna marble. The goddess is depicted wrapped in a himation (cloak). She wears her aegis bordered with small snakes over the shoulders. She stands with her left hand resting on her hip and would have carried a spear in her (lost) right hand. In the Homeric corpus, the aegis was Zeus’ magical breastplate (or shield) which he lent to his daughter Athena in honor of her role in principled warfare. In most accounts, it was described as a goat-skin construction bearing a Gorgon’s head at its center. The statue was presumably made according to a Greek model attributed to Praxiteles’ workshop. A large number of Roman copies have survived and one complete figure of this type can be seen in the Hermitage Museum in St Petersburg (see image here). Two other near complete copies are housed in the Fitzwilliam Museum in Cambridge (see here) as well as in the Ashmolean Museum in Oxford (see image here). On the basis of the arrangement and treatment of the drapery and the attitude of the figure (the hand resting on the hip), all these Roman replicas have been connected with one of the figures carved in relief on a pedestal from Mantineia in the Greek Peloponnese. 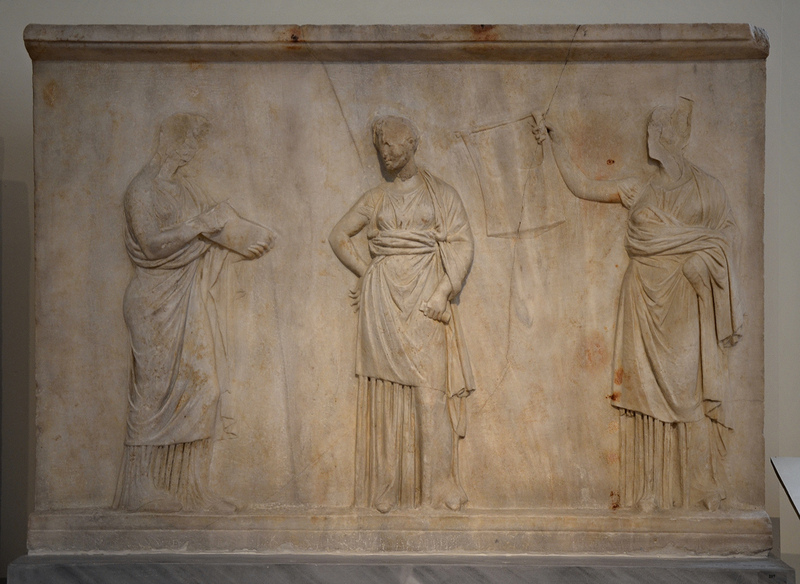 The marble slab above is part of a series of three slabs found in Mantineia in 1887 by the French School at Athens (École française d’Athènes). At the time of the discovery, the French archaeologist Gustave Fougères made a connection between Pausanias’ report of Praxiteles making statues of Leto, Apollo, and Artemis for the Temple of Leto at Mantineia and the marble slabs. In his ‘Description of Greece’ (8.9.1), Pausanias noted that images of Muses decorated the pedestal of this cult statue group. On this basis, it has been assumed that the reliefs were contemporary to Praxiteles’ work and were probably carved by one of the great sculptor’s pupils. The statue of Athena from Hadrian’s Villa was found in 1913/14 during excavations in the great dining hall (triclinium) of the Three Exedras and is dated to the mid-second century AD (after Hadrian, the villa was occasionally used by his various successors). It was on display in the villa paired with a second statue of the same type, now in the Antiquarium at Hadrian’s Villa (see image here). 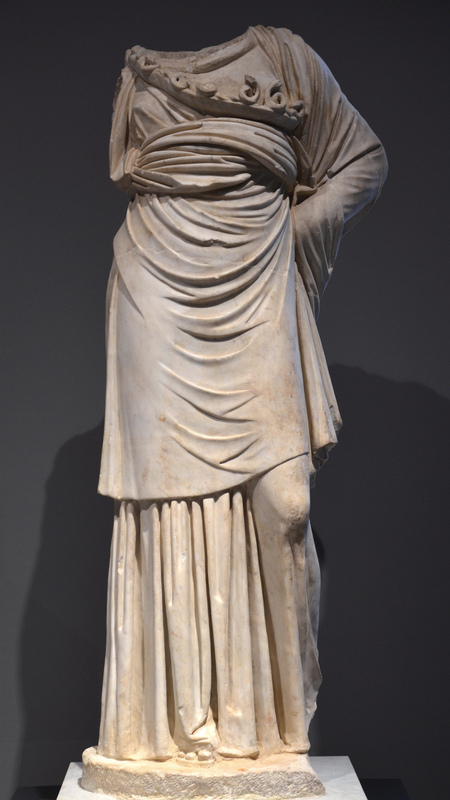 This statue is on display at the National Roman Museum – Palazzo Massimo alle Terme, Rome. Joachim Raeder, Die statuarische Ausstattung der Villa Hadriana bei Tivoli (Peter Lang: Frankfurt am Main, Bern: 1963) 31. Previous postFelix dies natalis, Roma! I have just found your blog. As an admirer of M. Yourcenar and an history enthusiast, I simply feel at home here, among your words and your images.